They are among the biggest builders, and not only of super yachts. These Dutch yards are part of the Damen group, a colossus with more than 9000 employees and 33 yards worldwide. The visit to the Amels and Damen yards in Holland began with an outing on the water on Game Changer, the impressive new 69.15 m support yacht built by Damen and sold by Amels. The two yards act together as part of the same big family: the Damen group. This family owned multinational operates through 33 yards. It was set up 90 years ago in Holland and today has more than 9000 staff (1000 of them engineers) and has delivered more than 6000 boats. It builds ships for a wide variety of specialist markets, including naval defence and coast guards, offshore construction and harbour/terminal vessels. It also has an international network of lifecycle support services that includes maintenance and repair & conversion facilities. In 2016 it delivered 90 tugs and work boats, 12 offshore vessels40 high speed craft and ferries, 26 pontoons and barges, 18 dredging and specials, 29 defence and security, and four yachts. Apart from the work and safety sectors, the Damen group entered the luxury superyacht sector in a decisive way with the purchase in 1991 of the Amels yard. This important name has marked the development of super yachts over time. 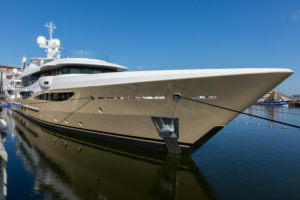 Today its production includes the Full Custom range and the Limited Editions (launched in 2005, with yachts of between 55 and 83 m) designed to strike a balance between full custom and semicustom yachts, with exteriors designed by Tim Heywood, naval architecture followed by the yard and the interiors chosen by the owner. An important and strategic advantage of Limited Editions is the build speed and hence the delivery speed compared with a fully custom-built yacht. Then there is the Refit division. Amels currently has 10 projects underway. 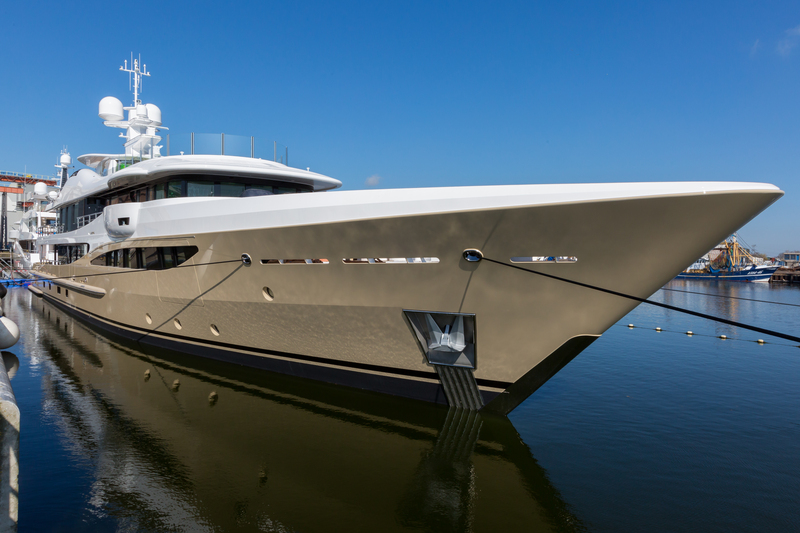 The year began with the delivery in January of Here comes the sun, the flagship of the Limited Editions and the first superyacht of more than 80 m built by Amels. She is 83 m (272 feet) overall, 14.54 in the beam with a draft of 3.85 m and has a displacement of just below 3000 tonnes (2827 tonnes). Building this yacht with a steel hull, aluminium superstructure, six decks and more than 1400 m² of interiors took 22 months. Her top speed is 17.5 kn and she has a range of 5500 miles. Exterior design is by Tim Heywood, naval architecture by Amels and the interiors were designed for the owner (a repeat client) by Winch Design. The beach club with sauna, gym and bar opens onto the sea both astern and to the side, on the main deck there is a large swimming pool in front of the entry to the saloon through a semicircular glass door. There are a total of eight guest cabins and a crew of 24+ the skipper. At the bow the cover of the garage for the rescue boat (which can be launched in five minutes in an emergency) is a helipad. The first spring 2017 delivery was Driftwood. This 55-metre is the 20th Amels 180 delivered since the first Amels Limited Editions yacht Deniki departed the yard almost exactly 10 years ago. Then came the launch of the Lili (55 metres), 12 months after the contract was signed, with various exterior custom elements including an extended Sun deck of almost 175 m² with a 4 m long sun deck pool (7000 L) featuring counter current jets for swimming. In the main saloon are two folding bulwarks and sliding doors and in the VIP cabin a private folding balcony. But an earlier, the 74 m Plvs Vltra (delivered in 2016) won a prize at the 2017 Asia Boating Awards, during the Singapore Yacht Show, as the best Semi Custom Built Yacht (above 120 ft). Plvs Vltra is the first Amels 242 to be built. Among the yachts currently under construction is the first Amels 188. A four-decker of 57.7 m that will have an innovative hybrid switchboard solution for energy management. The system combines three energy sources, mechanical (generators), electrical (Battery Bank) and heat (residual energy). It is not used only for occasional propulsion but to handle all the electricity needed on board (from the jacuzzi to the air conditioning). The yard says the system will promote an annual saving of at least €100,000. The 188 will be ready for summer 2018. The large beach club with access also from the interior is particular, and the owner suite of 80 m² is very spacious with a huge folding balcony. Coming up, but at the time of writing is still “mysterious”, is a new project for a Full Custom yacht. All we know is that it will be more than 100 m overall. While Amels concentrates on the luxury superyacht sector, Damen concentrates on explorers and support yachts. The SeaXplorer range, a crossover between professional technology and superyacht exclusivity, was presented at the 2016 Monaco Boat Show and for now includes three yachts of 65, 90 and 100 m (another is on the way) that comply with the United Nations International Maritime Organization’s Polar Code B category. The SeaXplorer range was developed through a unique partnership between Damen, Amels, Eyos Expeditions and Azure Yacht Design and Naval Architecture. Since optimising the SeaXplorer bow for Polar Class icebreaking would have directly compromised its seagoing behaviour, Damen decided on a double acting hull. This means the SeaXplorer has a stern optimised for icebreaking conditions, while the bow benefits from its stable and comfortable Sea Axe design. The first 65 m, sold last year, will be in the water in 2019 and ensures a range of 40 days without stopping in port. We end this look at the latest news from the Amels and Damen yards with the 69.15 m Game Changer, the latest support yacht to be launched by Damen (and soon to be followed by the 55 m New Frontiers). Support yachts are a concept on which the yard is banking heavily (a total of 11 Damen Yacht Support vessels have been delivered or are in build). They are designed to manage and transport everything an owner might need, starting from a helicopter. But also motorboats, submarines, sailing boats and diving equipment. They can house crew, offices and workshops so as to leave the mother yacht fully available for the owner. Game Changer is the flagship of the support yachts, with a displacement of 1285 tonnes, 250 m² of deck space and a 12 ton deck crane. It has a fully certified Helicopter deck and All-weather enclosed hangar, and can carry 22 crew members in high quality environments. It has a top speed of 21 kn and a range of 4500 miles.